Adam Wolfe: Blood of Eternity contains graphic content and is intended for mature audiences. Following his previous two cases, Adam begins to unravel a new mystery. This time, Adam comes to the aid of a painter that is besieged by a ghost. In his investigation, he learns more about the same cult and that it might be somehow connected to his missing sister. Through mortal danger, he reunites the painter with his departed wife but also attains a solid lead about his sister. For the final case, Adam finds his sister, but also the leader of the cult which took her, leading to a confrontation. He narrowly avoids death and ends up in a strange world that seems to be completely morphed even though it resembles reality. Battling madness, he manages to find his way back to reality where he sees that he is about to get killed by the cultists and their powerful leader. Instead, his sister sacrifices time and Adam avoids danger but ends up trapped in a place outside of this world. Adam Wolfe: Blood of Eternity is rated 4.6 out of 5 by 57. Rated 5 out of 5 by Italia47 from Graphic, Dreary & Engaging Game! MadHead Games, way to go! Very creative! Very intelligent game; so many tasks and mini-games. It's a shame there were only 4 chapters, which, by the way, was cleverly done. I really liked the characters, especially Adam and Allie. But I'm hoping to see more of Adam. His voiceover was excellent, too. 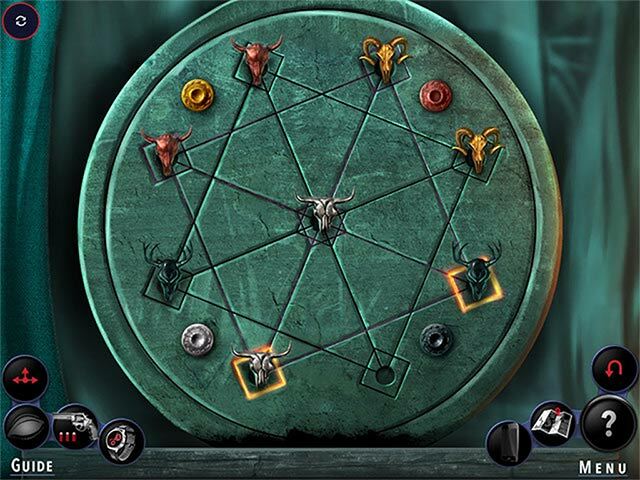 Paranormal/occultic games are not my favorite genre but the tasks will keep you thinking and busy throughout the entire game. I bought the SE version. Adam had so many close calls, I was starting to bite my fingerails at one point. Timelessness, watches, demonic birdlike creatures and, of course, there's always that evil warlord, if you will! Great game; outstanding developers! The graphics, music, and the flow were amazing. I highly recommend it! Rated 5 out of 5 by eurojosh from The Series You've Been Waiting For First time writing a review, but Adam Wolfe is the game series I've been waiting for. Superb dark narrative and graphics with a haunting storyline, this is more like Max Payne than the child-friendly series you mostly find here. 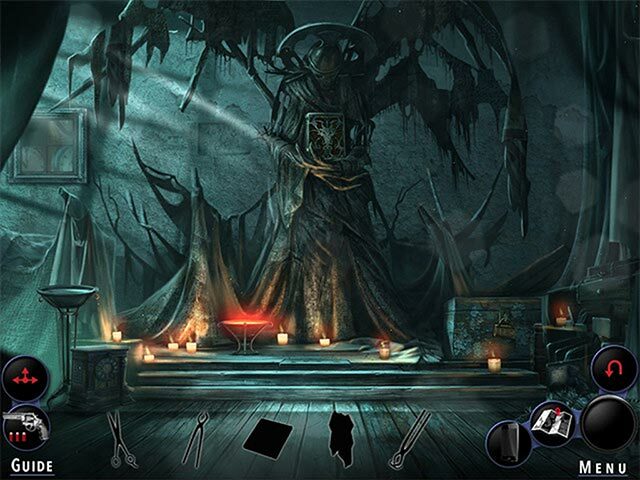 The puzzles could be a bit tougher, but that's more than made up for by the storyline and gaming experience. More like this please! Rated 5 out of 5 by ninja226 from Awesome sequel Sequels often don't match the quality of an outstanding original, but this game beat the odds and lives up to the 1st game's excellence. If there were Oscars for HO games, I would nominate this game for the following categories: --Best Voiceovers --Best Writing/Storyline It's a paranormal mystery that takes place in contemporary setting. It feels less like a synthetic HO game, and more like being transported into a top notch TV series starring you as the detective. This game is destined to be a classic. It completes the narrative begun in Flames of Time. I recommend both games for completeness, and for fun. Rated 5 out of 5 by katnap123 from I love this series! What an adventure! All the acting and characters are superb. The gameplay is smooth. The puzzles are on the easy side, but there's a variety, and I'll admit that I even skipped one where you slide bars back and forth to make a pathway. This game begins with act 3, so it's best to start with Adam Wolf: The Flames of Time before trying this one, even tho each act is complete in itself, and there are two acts to each game. Try the demo, and if you're not interested by the time the hour is over, then you're not out anything. I'm totally hooked and can hardly wait until the next installment. 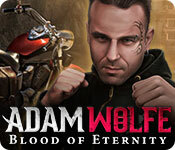 Rated 5 out of 5 by vmomahhj from Adam Wolfe: Blood of Eternity I have purchased this game,and I'am awaiting for the next adam wolf game. Rated 5 out of 5 by bessiegirl from Excellent game Most of my reviews about the Adam Wolfe series are posted in the first one which basically are the same for this one. An excellent, fun but challenging game. This one has chapters 3 and 4 in it as the first one has chapter 1 and 2 but each chapter can stand on its own the common thread being his search for his sister. I found the game a total hoot and enjoyed the dialog, of which there is a lot as well as terrific animations and graphics. Not really sure the need for the dire warning in the beginning. Rated 5 out of 5 by Majestyx12 from Very fast pace and you feel like your there There's fighting and shooting and the occult. Ghosts. Adam finds his sister. I love Adam's voice or the actor voice who portrays him Petar Jandric'. Rated 5 out of 5 by SamiraMay from Superb Game! The best game ever! Please make more like this game! Rated 5 out of 5 by Aniridia from This One Game Held My Attention to the Bitter/sweet End (of Eternity) Forgive me not editting more precisely. The stories in this series are really good, especially, especially, to me, the last. I have only played the first, third, and fourth, but I may be playing the second sometime soon.Fresh, original storylines that actually excite me, not just because they are creative and new; these ideas were well developed and they fascinate me - multidimensional flexable realities, better than ever. I loved the mind traveling through paintings. I loved even more the way reality had so many layers. I still like all the secret notes and scavaging through packs that don't belong to me, too. Characters too, were well made, intelligent, charming, and lbelievable, quite beautiful usually, for realistic cartoon (when I'd like them all to be photographic, myself) and voices were all soothing, pleasantly professional, as was music / background sound. And I am thankful for, of all things, the aesthetic appeal of the minigames, especially. This is important to me, because when my mind gets caught up in the joy of unraveling a (new or anew) logical rule system (in a quest for a talisman or piece of the puzzle) I really need the background to be a thing of beauty. I find the cursor to be more cleanly artistic and appealing than any I'd seen before, the game-piece-style circled hand. I enjoyed the usefulness of several permanent above inventory items, gps / jump-map, extra-sense eyesight (for visually appealing hop / sequencing activitie s) mfollowc d four story cards, cultic watch (mental time travel device from inside the story), handgun, & hint (15-90 secs). I would have enjoyed even more buttons on my phone. Why must I always borrow someone else's. Some of the story, including the very beginning where it stumped me, is introduced in story panels, 3 at a time, read or listen, click each one, x3, then click each panels key object from story sentance, not hidden but colours come out and game continues, easy ambiance enhancing graphic novel pages. I was glad there were only a few activities to do at a time, that I never had thirty-something things in my inventory and a map full of unfinishable statues / in unlockable traps / doors. There was enough to keep me investigative and active without overwhelming and boring me. Another thing I loved, that times and other details often needed to be memorized for near immediate use. Things were for seeing the other side of and turning over. Things were for going back iin time over. Layout was vivid and sureal, neat and tidy. Neat special affects. Nothing seemed not new. Everything made logical sense, without not surprising. Yet, it didn't leave me feeling clueless. Minigames were sometimes new! I think. Some were fun but easy. Others were neither too difficult (to me) nor easy. Wow! If only there had been more of those, a lot more. Some (not all) minigames / hops: 1. Compare differences between photo and present. 2. take pictures of astral activity and analyze them. includes paranormal info. 3.put paper clue together. 4. channel and cherrypick the lines of a hidden love letter as it is being written. 5. motorcycle relay 6.choose symbols from within a highly detailed collection of symbols. Nice writing here however morbid it is. 7.follow outlines with... writing instruments. more detailed work in second story was easier with touch screen. 8.follow specific sewer pipe to correct valve. 9.choose 3 symbols per word while listening to a cult poem. 10.find, complete, and use three syllouetted objects, and find, complete, and use several more (and more then) syllouetted objects, but patiently, as more work, was sometimes called for, just a little, not too much. 11.stop several clocks hands at (intuitively guessed?) correct times. 12.stop cross hairs in the green. 13.lovely, brightly lit, five styles hidden object puzzle, very easy (I think) 14. beautiful, wood-look line drawing, sliding panel wooden puzzle box. 15.match foreign scrawl cult symbols. 16.sliding painting panel puzzle, proper placing affects colour / light level. 17.follow 5part combination lock without pausing during each partial rotation. 18.an ingame interactive hop to collect the Book of Timelessness. flip through pages, find each talisman ingame to wake up the spirit living on each page who then gives a fortelling of fate. 19.place and spin 3 disks with differently coloured petals inside, line up petals to affect the colour of pill shaped connections between the disks exactly so. There are others. There is a lot (to me) of brief (at least) hand to hand combat. I wouldn't have thought of it. I would have liked more challenging minigames and less challenging ingame work even more, but this game was a real joy to play, very entertaining and good looking (maybe the sewers were dank and dismal). The hops were not difficult or too easy and were nice to look at. It is not too short or too long and is really really replayable content. 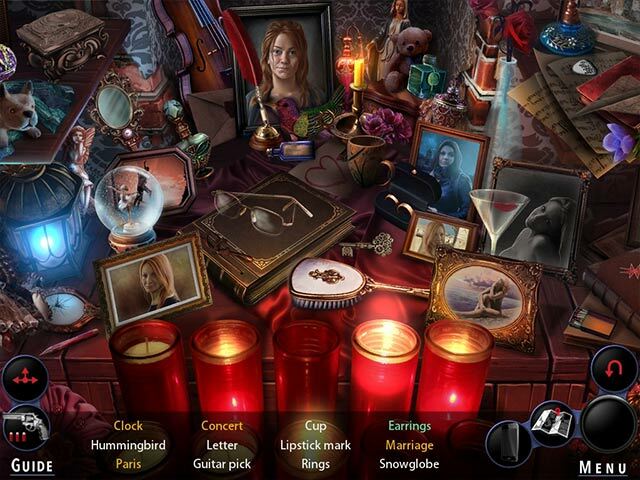 Acting as a private detective, resolve supernatural cases and follow the trail to your sister.